To sync your articles in from an external knowledge base, head to the Content section in your left menu. From the content dashboard, click on Sync in the top nav, to reveal the sync panel. Each integration option comes with easy step-by-step instructions to follow, and once you’ve filled in the blanks for your respective service, you will be able to perform a sync with that service at any time. To re-sync your already integrated articles, simply hit the ‘Sync Content’ button and hit "Re-Sync" for the integration you have setup. NB Elevio will only sync one way. While it is simple to sync articles in from other sources, you will be unable to sync any articles out of elevio to elsewhere. On our Premium plan your account is automatically set to ‘auto sync’, which will occur every 6 hours (we can turn this off for you if you’d like). Any manual syncs are added to the same queue, so there can be a bit of a delay if you happen to request a sync during that time. I delete an article, but it's still in Elevio... why? When you delete an article from a third party, such as Zendesk/HelpScout etc, that content is not removed from our local storage. Not deleting our local copy is by design, so no destructive actions prematurely take place and break any existing links to that content. Essentially, there are too many ways in which an article can accidentally be removed if there is some issue with the sync process, which will result in any links to that content also breaking. When the article is re-synced, it will appear with a new ID, so any previous links to that content (also including helpers or embedded articles) will also break. 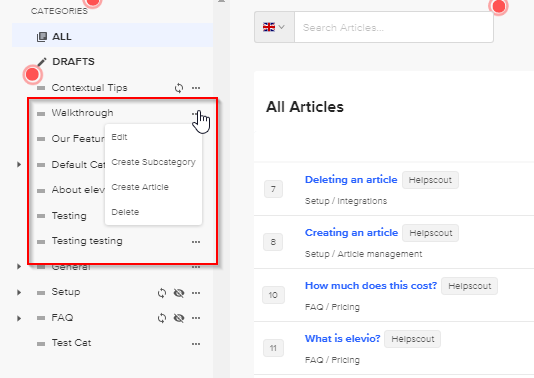 Until there is a robust solution to this, you will need to ensure that any content you remove from your main source, you also remove from Elevio, or, make the move and use Elevio as your main source for content.